I also enjoyed other dishes like Thai Eggplant Basil Curry, Red and Green curries with tofu and vegetables, and vegetable fried rice. Surprisingly, I preferred the vegetarian street food to the offerings of the many vegetarian restaurants in Bangkok. Fortunately, most all of my guesthouses also had decent restaurants, which worked well for breakfast and lunch. In the evening, I usually went exploring and tried more vegetarian street food from the carts. Christmas was approaching, so I booked a bus ride to a small coastal town several hours away. From there, I took a ferry to Koh Chang (Elephant Island). Back then Koh Chang was still relatively undeveloped, unpaved, and unexplored in comparison to neighboring Koh Samui. Now both are touristy mega-resort destinations and the remaining less discovered islands remain somewhat guarded secrets among backpackers seeking quiet, peaceful retreats. In 2000-01, when I stayed there, Ko Chang was exactly that. I rented a thatched hut on the beach for about $7 a night. I woke up to the sound of the waves and went swimming at least twice a day. I ate my meals at the White Sands Beach resort, at small tables with an amazing view of the crystal clear, beautiful sea. Almost very morning I ordered pineapple pancakes from the kitchen there. Ten minutes later I’d get a whopping plate of steaming pancakes cooked with crushed pineapple, and garnished with even more delicious fresh pineapple. This vegan recipe is my best attempt to recreate those nostalgic pancakes with all the flavor and fun of the many breakfasts I had on my four week trip exploring Thailand, Vietnam, and Cambodia. Mix flour, soy flour, sugar, baking powder, cinnamon in mixing bowl. Add soy milk, water, 1 tsp oil and mix until mostly smooth, some lumps are okay. Add chopped pineapple and stir a few times. Let batter sit for 10 min. Heat a frying pan on medium heat. Apply a few drops of oil to pan and rub around with a paper towel. Pour batter onto pan and spread pineapple flat with spatula. Cook until bubbles form over surface of pancake, 3-4 min. Turn pancake with a spatula and cook other side until golden brown, 2-3 min. Transfer finished pancake to another pan on low heat to keep warm. Repeat for other pancakes. Garnish with margarine, pineapple, powdered sugar, cinnamon. Serve with agave or maple syrup. 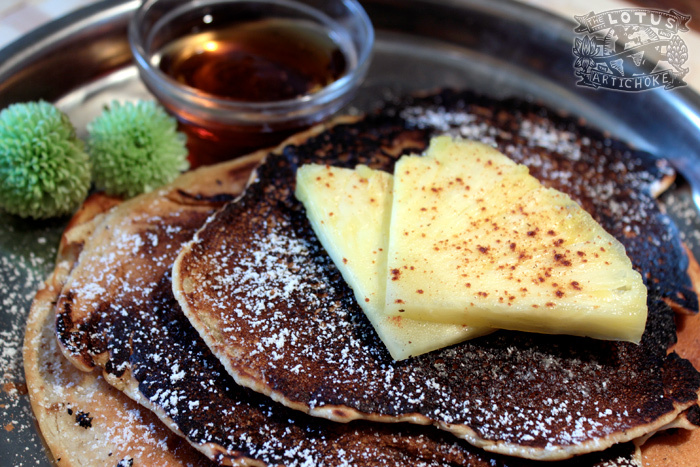 This entry was posted in Thai and tagged pancakes, pineapple, recipe, southeast asia, thailand, vegan. Bookmark the permalink. What a lovely trevel route! These pineapple pancakes look so interesting & well-flavoured too! :) Yummm! I can’t wait to make them!